AMBRIDGE, PA - Circa March, 2017 - A slowly moving forward snowy establishing shot of St. John's Lutheran Church in Old Economy Village. AMBRIDGE, PA - Circa March, 2017 - A slowly moving backwards snowing establishing shot of St. John's Lutheran Church in Old Economy Village. 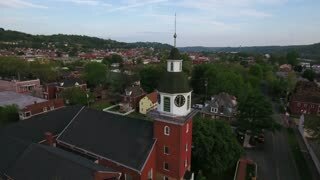 AMBRIDGE, PA - Circa March, 2017 - A slowly moving forward and backward summer evening establishing shot of St. John's Lutheran Church in Old Economy Village.